Electronic check re-presentment, or check recovery, is a method by which merchants process bad checks or NSF items. One option available for merchants to recover bounced checks is by hiring a re-presentment agency. Some banks contract with re-presentment firms and automatically enroll their commercial checking customers (i.e., businesses that accept checks from consumers) in re-presentment services. The re-presentment firms take a fee for each re-presented item, and the fee revenue is shared with the bank. Businesses should notify consumers that a check recovery process is in place before consumers pay by check. If the consumer is unaware that a re-presentment company is placing a charge on their NSF items, the re-presentment agency, merchant and/or bank may have violated the law. Send your Bounced Check Recovery claim to a lawyer who will review your claim at NO COST or obligation. The re-presentment agency resubmits the check electronically to the check writer' bank account and charges a fee, which is typically split with their 'client,' such as a bank or merchant. Because the re-presentment firm (and the bank of the business that accepted the consumer' check) has no contractual relationship with the consumer, the fee does not look like a typical bank fee and, rather, will show up in the form of an electronic check or electronic transfer initiated by the re-presentment firm using account information taken from the consumer' check. Check recovery companies claim they give organizations faster bad check recovery rather than traditional methods (i.e., internal employees recovering funds), resulting in approximately 20 to 30 percent higher recovery rates. But some re-presentment agencies charge as much as 50 percent of the total amount collected as payment for their services. If a consumer writes a bad check and is not informed by the merchant and/or bank of additional NSF charges, the re-presentment firm, merchant' bank, or merchant itself might have violated the law. Consumer fraud attorneys have an ongoing investigation to determine the legality of these check recovery agencies if the consumer has not given permission for charges to be made against their account. The merchant has to give notification so that the consumer is aware there is a re-presentment recovery process in place. A merchant can charge your account a fee if you write an NSF check—as long as you have been notified by your bank. When these third parties are placing a charge unbeknownst to the consumer during the re-presentment process, the consumer could be charged anywhere from $20 to $60 for one NSF check, and possibly more with multiple NSF checks. 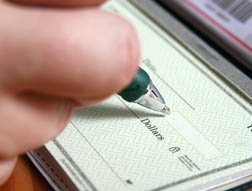 Consumers who notice an unfamiliar electronic check or electronic transfer in their checking account activity might have been subjected to the re-presentment process, and consumers could confirm this by examining canceled checks on their monthly statement, or in online banking to look for checks that they did not write. Bounced Check Fees: Who Is at Fault? The bank, re-presentment company and/or the merchant can all potentially be liable, according to debt collection law. Charges are being made by the check recovery company, but the fraud is being committed by the merchant' bank, or the merchant itself, if the re-presentment company is getting a kickback, and/or splitting the fee with the bank and/or merchant. A class-action lawsuit was filed in 2011 in the US District Court Southern District of Florida by Ruth Muzuco against Re$ubmitIt (a re-presentment company), BSG Financial, LLC and BankAtlantic. Muzuco' lawsuit claimed the defendants improperly and unlawfully took $50 directly from her bank account, without her authorization or consent, as a purported "fee"for re-submitting to her bank account a bounced check. The class-action lawsuit is "challenging the Re$ubmittIt check representment program purchased by BankAtlantic from BSG Financial, LLC and asserting claims under the Fair Debt Collection Practices Act, the Electronic Funds Transfer Act, as well as common law claims of conversion, unjust enrichment and civil conspiracy,"according to court documents. Muzuco wrote a check for $1,000 to her lawyer, but the check bounced. Her bank forwarded the NSF check to the Re$ubmitIt Defendants instead of returning it to her lawyer. BankAtlantic notified the lawyer that the returned check had been forwarded to the re-presentment company—Re$ubmitIt. Muzuco' claim sought actual damages, statutory liquidated damages, and attorneys' fees as a result of Defendants' violations of federal and state law (15:1692 Fair Debt Collection Act). She also asserted claims for conversion, unjust enrichment and civil conspiracy. Re-presentment practices are currently being investigated by consumer fraud attorneys, and the Better Business Bureau has received a number of complaints involving re-presentment companies. If you or a loved one has suffered similar damages or injuries, please click the link below and your complaint will be sent to a Consumer Fraud lawyer who may evaluate your claim at no cost or obligation. Check Re-presentment Attorney: Consumers May .. THE BANK MADE 1000S OF DOLLAR FROM MY BANK ACCOUND FOR OVERDRAFT FEES , THEY NEVER LET ME KNEW ABOUT A BOUNCE CHECK JUST MADE ME PAY 35 DOLLAR FOR OVERDRAFT FEE M&F BANK, REGINAL BANK, BOLIVAR BANK IN MS. I would like to speak to someone re Wells Fargo in CA. Over the phone without telling me. They have endless hidden charges and when my account was opened they did transactions that I never authorized for them to do, which in turn cost me more money.